We cater for wedding parties of all sizes. 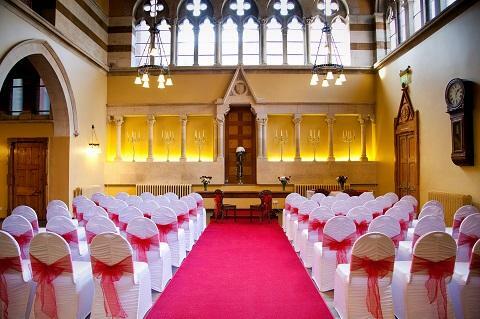 From the Great Hall, licensed to hold up to 220 guests for a wedding ceremony, to smaller rooms catering for intimate ceremonies, the Guildhall can ensure that all of your needs for your special day are catered for. * Due to the orientation of the room the following items are not available to use - red carpet, chair covers and sashes and the star cloth. ** Due to the orientation of the room the following items are not available to use - star cloth and PA system for your music. You'll receive a personal service with the Guildhall's wedding team who are there to make sure your day runs smoothly without you having to worry about a thing. The extensive menu selections available ensure that your wedding breakfast is perfectly suited to your needs as well as meeting any dietary requirements your guests may have and the late licence means that you can party the night away. Marriages in the ceremony room are managed independently by the Northamptonshire County Council registrars. Please visit the Northamptonshire County Council Registration Service web pages or email [email protected].